We’ve been working with motor dealer Pebley Beach for six months now, and during that time we’ve generated tonnes of press. And after the company was crowned Wiltshire Business of the Year, we decided to do something a bit special to promote the firm – produce a newspaper. Now, despite being a director of Marlborough News Online and publisher and editor of Wiltshire B2B news website Business Biscuit, it’s been eight years since Agent Pete last layer out a newspaper page. 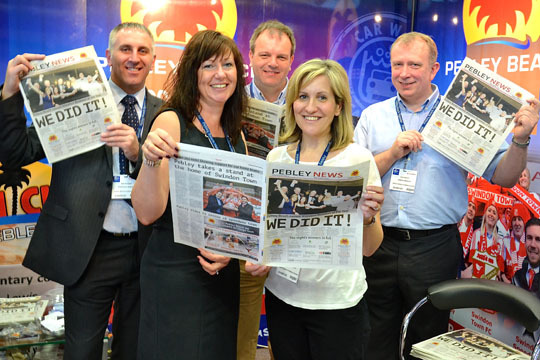 Thankfully, page layout is like riding a bike, and Pebley soon had an eight page newspaper, which was published as a supplement of the Swindon Advertiser and given out at the Wiltshire Business Show in Swindon on May 15. The exercise put Pebley’s message in front of 16,000 readers. By publishing as a supplement in the Swindon Advertiser they hit their local target audience. Plus, they had spare copies to use for promotional purposes once the Adver had left the shelves. And the best news is, a stunt like this is far less expensive than you’d imagine. With PR, we can turn your business into news. And if you want to turn your news into a newspaper, we can help you with that too! This entry was posted in Business, Cars, Client news, Marketing tips, Secret Agent Marketing and tagged newspaper, Pebley Beach, Pebley News. Bookmark the permalink.